Last week I went on the Music Boat 2010 Cruise with a dear friend and my youngest son. We had been anticipating this cruise since January. My friend had been anticipating this cruise because she’d never been on one and she was very excited. My son had been anticipating this cruise because he was dreading the time apart from mommy. Two back to back classes in October that had sent him into a tailspin of separation anxiety however, led me to add him to our traveling party at the last-minute. So his anticipation soon turned to excitement as well. My anticipation was unrealistic. This was the same cruise that Larry and I had been on 5 years before to celebrate our 10th Wedding Anniversary. The dates this year were so “coincidental” though, November 8 – November 12. November 8, the 1 year anniversary of Larry’s death; November 12, the 1 year anniversary of Larry’s funeral. Perfect. I wouldn’t have to be home for these painful days of reminders. Instead, I could sail away on a ship of wonderful memories and avoid the pain altogether. Play Scarlett O’Hara and think about it tomorrow, when I got home. There would be some very significant artists on board as well, songs that had played a major part in the cancer journey and in my healing path as well. So, sail away we did. I was very blessed to be able to talk to Jeremy Camp, to tell him how much his music meant to us during Larry’s illness. I was able to share with him that 3 of the 4 songs played during Larry’s funeral were his songs: I Still Believe, There Will Be A Day, & Surrender. The 4th song was a recording of me singing You Are Still Holy. God Also provided the opportunity for me to share with Mandisa how much her song You Wouldn’t Cry For Me Today has ministered to me since Larry’s passing. She even mentioned me in her concert! Bello Nock was amazing! He walked a 1/2″ wire 403′ between the two highest points of the ship while it was in motion! Crazy! He set a new category for Guinness World Book of Records even. Noticed that the papers are leaving the Christian part of the Premier Cruises out when reporting it though. Couldn’t possibly put that one in the papers could we? The weather was amazing, the food was abundant. The service was fantastic, of course. Our dining table companions have become friends, their son is a freshman at Liberty University, my oldest (by one day) is a senior there… coincidence? Nah! And yet with all of this amazing and wonderful and abundant life… I was alone. My wonderful memories were painfully sweet, wonderful to relive and yet I felt my alone-ness even more keenly in those memories. We had breakfast with a delightful old man one morning. His name was Lou. He had been a widower for 9 years. He told me that he hated it when he’d reached the one year mark and people told him that it had been a year now and he was supposed to be over it. Lou said you never really get over it, you just learn to move on. Lou was hilariously funny, he kept the whole table laughing all through breakfast. We ran into Lou on the island a few times as well, and even though Lou was delightful company, Lou was also alone. You could hear him telling the same stories to whoever would listen. He been with his wife since they were 5 years old, together 60 years. Childhood playmates, high school sweethearts, married, widowed, alone. 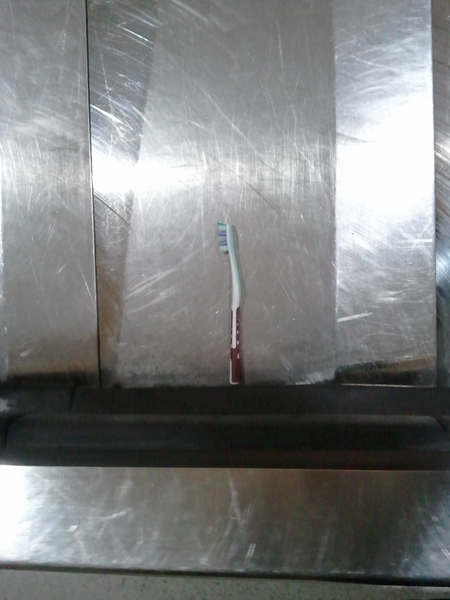 When we landed in Detroit and went to the baggage claim we found a tooth-brush on the baggage carousel. We watched as this solitary toothbrush waited patiently in eager anticipation for the moment when someone would step up and claim it. No one did. As far as I know, this lonely solitary toothbrush is still there, waiting on carousel 8 at Detroit Metro Airport, hoping that someone will see its potential and claim it for the purpose for which it was created. At first I thought the toothbrush was rather silly, but the more I think about the toothbrush, the more I find myself relating to the toothbrush. Alone on the carousel of life once more, waiting patiently until my purpose finds me and claims me. < Previous Where Do We Go From Here? WOW, that was amazing Shelley. I had some friends on that same cruise..I wonder if you ran into them? Barbara Borton? She was at my house for the WOF reunion..and on the WOF trip. I am amazed you were able to talk with Jeremy Camp and Mandisa (both my favorites!) I am in awe..and so glad you met that man at your table..etc..You have a real talent in writing my friend. Praying for you and thinking about you a lot..
ps. thanks for letting me whine about WOF the other day..LOL I just needed to get it out.. Thanks Laura! Yep, we did run into Barbara, waiting in line for the dining room…. there’s a line for everything! We need to get together again soon to talk about WOF ’11!! And you can whine to me any time you need to darlin’, that’s what we’re here for!